Got Advanced Endpoint Protection? Use Our New Documentation to Get Started! Palo Alto Networks Advanced Endpoint Protection is a complete paradigm shift from identification to pure prevention. Our solution requires no definitions updates, protects unpatched systems, requires no hardware, is compatible with all physical or virtual Windows platforms including terminals, VDIs, VMs, and embedded systems, protects all processes including third party, and most importantly, doesn’t need prior knowledge of an attack in order to prevent it. The Advanced Endpoint Protection solution uses a central Endpoint Security Manager to manage policy rules and distributes the security policy to endpoints in your organization. The Endpoint Security Manager communicates with the protection software, called Traps, that is installed on each endpoint in your organization. To aid you in deploying Advanced Endpoint Protection in your network we have released the Advanced Endpoint Protection 3.1 documentation. 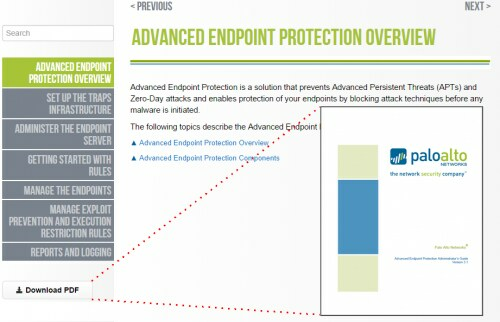 The Advanced Endpoint Protection Release Notes provide important information about Advanced Endpoint Protection 3.0 and 3.1 including new features, limitations, and known issues. The Release Notes are available in both HTML or PDF formats. The Advanced Endpoint Protection Administrator’s Guide provides comprehensive information for setting up your endpoint infrastructure. In addition, this guide provides best practices and instructions for installing Traps on the endpoints and provides instructions that detail how to use the Endpoint Security Manager to manage endpoint security policies and Traps settings. Like the Release Notes, the Administrator’s Guide is also available in HTML and PDF formats. 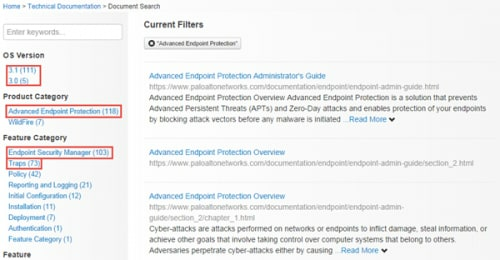 You can search for Advanced Endpoint Protection content using the facets on the Document Search page. 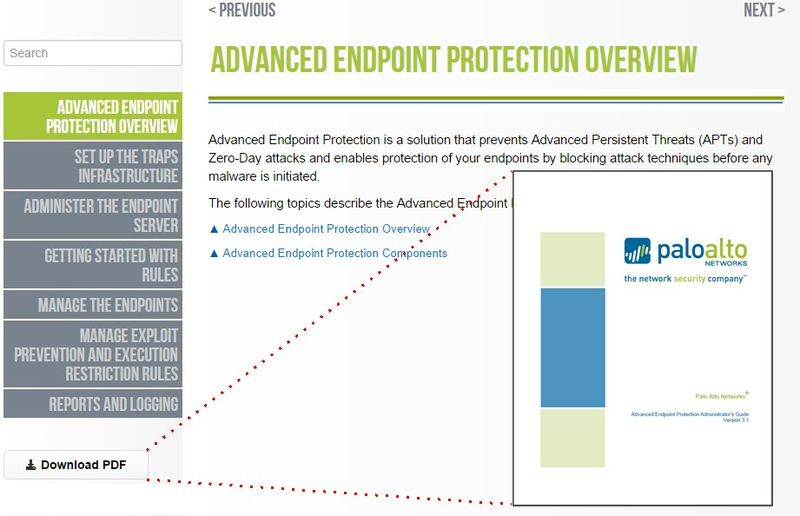 Use the Advanced Endpoint Protection product category to see all endpoint documentation and narrow your results by OS Version (3.0 or 3.1), Feature, and Information Type. To view release note information, select the Release Note facet under Information Type. For information on a specific known issue, use the identification number to search. We hope the new Advanced Endpoint Protection documentation enables you to protect your endpoints with ease and confidence. Let us know what you think by leaving a comment below or by emailing us at documentation@paloaltonetworks.com. Why Is It So Hard to Explain Cybersecurity?